Nürburg/Sant’Agata Bolognese, September 17, 2016. Two pole positions and first absolute victory for Harald Schlegelmilch: at the Nürburgring, home of the fifth of the six double rounds of the Lamborghini Blancpain Super Trofeo Europe, the driver of Artline Team Georgia has been the number one protagonist of the first part of this weekend. A success, the second one in his class this year after that obtained at Spa, which relaunches Schlegelmich in the PRO standings, where Vito Postiglione (Imperiale Racing) finished third behind an impeccable Loris Spinelli (Antonelli Motorsport) but he then received a 30-second penalty for crossing the white line of the pit lane during the pit-stop, therefore he was relegated to the seventh position. The Dane Dennis Lind (Raton Racing) suffered a similar fate: he arrived fourth but was then relegated to the tenth position. Schlegelmilch, who established a new record of 1’57”974 in the first qualifying session, made no mistakes at the start and maintained his leading position until the pit-stops, then he returned to the track ahead of Spinelli, who had to desist from making further attacks, after trying to overtake him on a couple of occasions. Just behind them, the strong struggle between Lind and Postiglione was won by the Italian driver. Instead, Marting Kodric paid the consequences of a difficult start. The Croatian of the team Bonaldi Motorsport was forced to run wide at the first turn, thus falling in twelfth position and finished sixth despite a ten-second penalty for not respecting the yellow flags. His teammate, Rolf Ineichen, who preceded him, was inflicted the same penalty. Florian Spengler and Christopher Zöchling (Konrad Motorsport) instead got the bottom step of the podium in the PRO. The Israeli Bar Baruch debuted and won in the PRO-AM: the driver of the Young Drivers Program of Lamborghini Squadra Corse, who shared the cockpit of the Huracán Super Trofeo of the team Vincenzo Sospiri Racing with the returning Kei Francesco Cozzolino , also managed to secure the third place overall. The Dutchman Rik Breukers (GDL Racing) scored the second place in his class and Arne Hoffmeister got the bottom step of the podium with the car of Dörr Motorsport. Patrick Kujala and Adrian Amstutz finished only in fifth position, after being forced to start from the back. This result, however, enables the duo of Bonaldi Motorsport to remain ahead of Breukers in the championship. 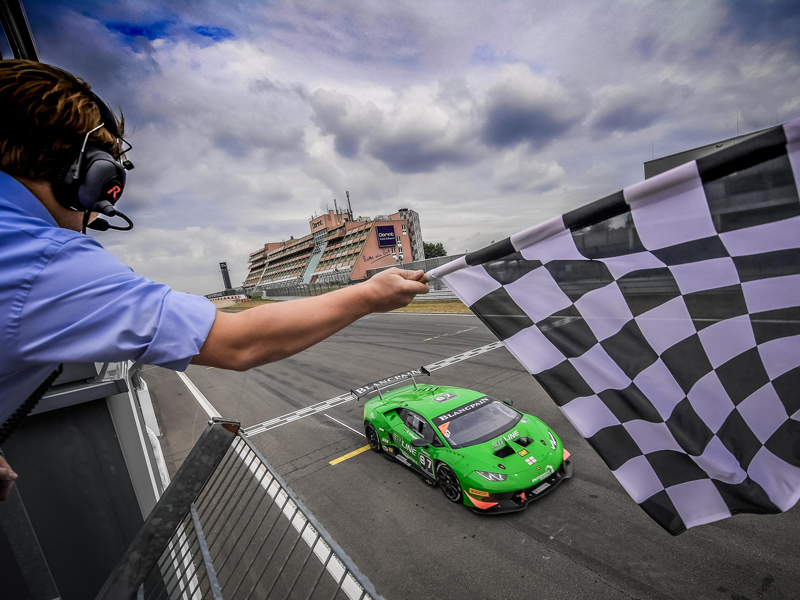 First victory also for Amir Krenzia, who won in the AM class with the colors of Vincenzo Sospiri Racing, while in the Lamborghini Cup, the Dutchmen William Van Deyzen and Gerard Van der Horst secured a “one-two” for the team Van der Horst Motorsport. Harald Schlegelmilch #87 - Artline Team Georgia (first overall and in the PRO class): “This is my first overall win. I’m happy for the whole team which did an excellent job. It was not easy, because throughout the race I was put under pressure by Spinelli, who repeatedly tried to pass me. But my car was really perfect today and the proof of it are the two pole positions conquered during qualifying”. Bar Baruch #66 - Vincenzo Sospiri Racing (first in the PRO-AM class): “I immediately got in tune with my teammate Cozzolino, who did a good job, by enabling me to score this victory. Even if I didn’t know this track, I did all my best. I’m really happy with this result”. Amir Krenzia #67 - Vincenzo Sospiri Racing (first in the AM class): “This is my first success, which followed the excellent result during qualifying. Getting the top step of the podium on this track is really fantastic”. William Van Deyzen #97 - Van der Horst Motorsport (first in the Lamborghini Cup): “It was a very hard race, but I really enjoyed myself. This victory is also very important for the championship, as Tim Richards finished further behind on this occasion”.